This one ain’t for dainty eaters. Enormous ribeyes, nearly two-inches thick, each tipping the scales at about a pound and a half. The cowboy cut has a couple inches of bone sticking out, giving you a handle to hold onto the largest meat hammer you’ve ever seen. More than big enough to share, but so scrumptious you’ll want to keep it all to yourself. The ribeyes come from Carman Ranch out on the rolling prairies of eastern Oregon. The cattle spend their entire lives eating local, native grasses, out on pasture as much as the seasons allow. While the ranch isn't certified organic they follow organic practices, including not using any pesticides, fertilizers, growth-promoting antibiotics, or hormones. The result of all of the careful attention to raising great cattle is super flavorful beef. But there's one last step that turns the flavor up to eleven. The beef is dry aged for two weeks. The difference in flavor after those two weeks is astounding. The dry aged beef is sweeter, more tender, with a deeper, richer, more complex flavor that lasts much, much longer. Eating these steaks is a real pleasure. "The ribeye was outstanding quality. I seared it on the grill for 4/5 minutes each side super high temp (550F) and it gave it the best, crunchiest, perfect lining! Let it rest for 5 minutes and than sliced it thin....It was crunchy outside, cooked in the edges and blue inside! I prepped a kind of a very Italian chimichurri sauce: minced garlic, finely chopped parsley, finely chopped tomatoes (only the outside, not the pulp), soaked them in extra virgin olive oil and added some salt. Oh man I loved it!" 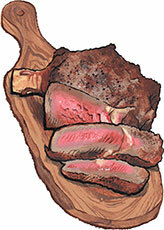 "I will never forget my first order when I bought the cowboy-cut rib-eye steaks and my family sat down to eat them. I was concerned as I normally would not spring for the best and was so hopeful it would be worth it. There was not a word spoken as we ate. Everyone was focused on their steak. Finally we all looked up and you could see in everyone's eyes that they had never had meat like this before. It was simply the best any of us had ever tasted. We still talk about that."